Jessica Hendricks has worked as a professional journalist for CBS and ABC News in the areas of health, fitness and nutrition. Passionate about wine, she has also worked for several food and drink publications. She holds three master's degrees in Eastern European culture, journalism and nutrition and dietetics. Long considered a health food, especially if it is low-fat, cottage cheese is a rich source of essential nutrients, including calcium and protein. Because your body digests cottage cheese slowly, it is prized by athletes, fitness buffs or anyone who wants to stay well-nourished throughout a long day. Naturally low in acid, cottage cheese might help with indigestion, but if you are lactose-intolerant or mixing it with meat products, it might cause heartburn. Cottage cheese is made from skim or partly skimmed milk, although it now sometimes has added cream for greater richness. 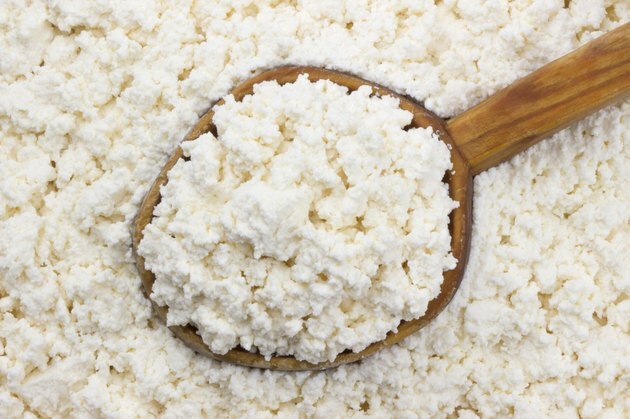 Cottage cheese has a mild taste, small to large sized curds, a moist texture and low acidity because the curds are washed beforehand. Cottage cheese can be plain or flavored, and with or without added cream. Cottage cheese contains casein and whey proteins. While whey protein is easily digested by your body, often in less than an hour after eating, casein takes longer to digest, requiring upwards of seven hours. Cottage cheese is also naturally high in calcium, which can help reduce heartburn and upset stomachs, according to Gordon Wardlaw, author of "Contemporary Nutrition." A 1-cup serving of low-fat cottage cheese has 206 milligrams of calcium per serving, providing between 17.1 percent and 20.6 percent of the recommended adequate intake for adult men and women. Cottage cheese contains lactose, a natural sugar in milk and milk products. People with lactose intolerance have difficulty digesting lactose. This is due to a lack of lactase, the enzyme that breaks down lactose, or poor lactose absorption. In both cases, this leads to excess gas and fluid in your large intestine during the digestive process. People who have a known lactose intolerance should avoid eating cottage cheese or consider eating it sparingly. Because cottage cheese is slowly digested and has a high calcium content, it does not always mix well with other foods in terms of digestion, particularly meat and meat products. Frances Sizer, author of "Nutrition Concepts and Controversies," states that enzyme and digestive juice effectiveness is reduced due to the long digestion time, leading to meats passing through your system undigested. This can cause heartburn, gas and pain in your abdomen. Can Coffee Get Rid of Stomach Bloating? What Are the Causes of Stomach Pain When Swallowing Food?